A brief slideshow about us. Email your photos and measurements. Include dimensions on the same plane as the lettering surface so that we can bring your photo up to scale when we design the graphics. We invoice the email you contact us from and begin work upon receipt of payment. We retouch the photos to remove old lettering or to virtually repaint your hull in a new color. A measurement between two easily visible points on the plane of the lettering surface allows us to scale the photo to actual size. Our first draft ideas are posted in only a few days and you are notified by email. 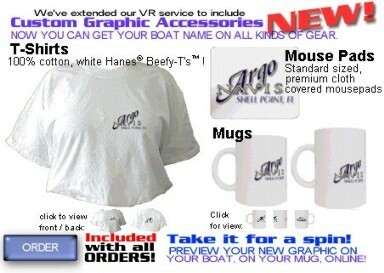 Click on the samples to view them on your boat! Notice how the style, color, and scale of the lettering alter the overall look of your vessel. Contact us with comments, questions or suggestions. We try to narrow down your favorite ideas quickly starting with a few various approaches, then fine tuning in successive interations. The goal is to have your decision in less than 8 iterations over, perhaps a weeks time max. Your favorite final design is quoted based on its size and the materials used. 22kt gold leaf costs more than silver, digital prints, cut vinyl in that order. Your custom order includes a storefront where you can preview over 100 matching caps, mugs, shirts and other gear for the crew. Custom boating accessories to match.